I've just attempted to get my hands on Michael Sandler's book "Barefoot Running: How to Run Light and Free by Getting in Touch with the Earth" and it's proving to be a bit of a mission, unless my money tree starts growing, and quickly. 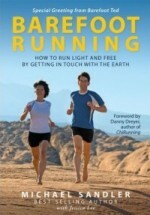 The book has just been released and the reviews of the book are starting to popup all over the barefoot and minimalist running websites. I consider myself to be a seasoned barefoot runner now, but I'm eager to have a read through this book to see how closely my experience has been to that of the author's and also to see if I've missed some "magic trick" or other little useful snippet that would help improve my barefoot running. So, the first place I hit was Amazon.com. I've got a gift voucher that isn't transferable to Amazon.co.uk so thought I'd use it for this book. Nope. Sadly, the book isn't sold directly by Amazon, but rather by the publisher and they won't ship to the UK via Amazon. The book also isn't available via Amazon.co.uk, nor any of the other European equivalents. So it's to the book's site itself. Well, that's a bit of a dead end too - the cost of the P&P is nearly as much as the book. The book costs $24.95 and P&P to the UK is $19.95. Add to this the fact the Pound is sliding against the Dollar, by the time the book arrives in the UK I could soon find myself in the position where the book costs more than £18 and thus becomes liable to import duties (not VAT as books are exempt) and thus I'd have paid more than double the price for the book. Eager to find out if there is anyway I can get this in the UK without it costing me twice as much, I've used the book site's contact form to find out. I'll update you when I hear back. In the mean time, if anyone knows of somewhere in Europe that is selling this book, then please let me know. you soon. We'll let you know as soon as we do. So when I know more, I'll let you all know. Update - 9 Jul 2010 @ 11:45: Looks like Jessica forgot about me as I've just discovered the book is now available to buy in the UK.